Hollywood discovered Peggy-Jean Montgomery when she was just 19 months old and made her a star before she was two. By the time she was six, Baby Peggy had appeared in feature films, more than 150 popular shorts and was earning $1,500,000 a year -- making her one of the most popular stars in Hollywood. All around the world, stores sold Baby Peggy dolls, sheet music, jewelry and even milk. But by the age of 11, she was blackballed out of cinema and washed up in Vaudeville. Baby Peggy was broke -- her money twice stolen and squandered by her family. A has-been without any formal education, she had never even been taught to read or write. Over the course of the next six decades this neglected child reinvented herself as Diana Serra Cary, a respected author, film historian and advocate for laws protecting child performers. Now 94 years old, she is charming audiences and critics all over again with her brilliance, talent and generosity of spirit. With narration co-written by Cary, Vera Iwerebor's moving documentary combines rare clips from Baby Peggy's films with an intimate portrait of a woman who lost her childhood to the movies. The recent rediscovery of many Baby Peggy films now gives new generations the chance to fall in love with a plucky young actress and the lovely and accomplished woman she became. 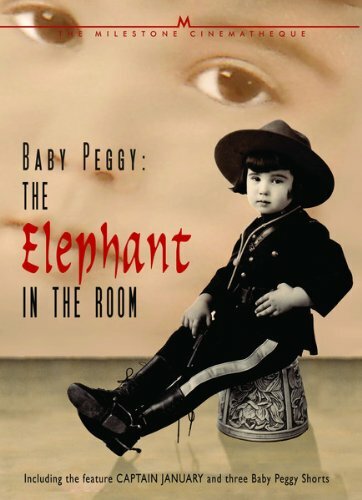 Like its star, Baby Peggy: The Elephant in the Room is filled with humor and a love for cinema and for life. Exclusively distributed to wholesalers and stores by Oscilloscope Laboratories. or by calling our toll-free number (800) 603-1104. * Baby Peggy: The Elephant in the Room Director: Vera Iwerebor. 58 minutes. 16:9. * Captain January (1924) 64 minutes. Starring Hobart Bosworth, Baby Peggy and Irene Rich. Music composed and performed by Donald Sosin. With Joanna Seaton (vocals). * Three short films starring Baby Peggy: Carmen, Jr. (1923), Peg O' the Mounted (1924) and Such is Life (1924). Music composed and performed by Guenter Buchwald. * Song: "That's My Baby" performed by Donald Sosin (piano) and Joanna Seaton (vocals). Street: November 5, 2013. DVD (c) 2013 Milestone Film & Video. DVD. ISBN: 978-1-933920-47-4. Mile00127. UPC Code: 784148012742. List price: $29.95. Milestone was started in 1990 by Amy Heller and Dennis Doros out of their New York City one-room apartment and has since gained an international reputation for releasing classic cinema masterpieces, groundbreaking documentaries and American independent features. Thanks to the company's work in rediscovering and releasing important films such as Alfred Hitchcock's Bon Voyage and Aventure Malgache, Charles Burnett's Killer of Sheep, Kent Mackenzie's The Exiles, Lionel Rogosin's On the Bowery, Mikhail Kalatozov's I Am Cuba, Marcel Ophuls' The Sorrow and the Pity, the Mariposa Film Group's Word is Out, Shirley Clarke's The Connection, Ornette: Made in America and Portrait of Jason, Milestone has long occupied a position as one of the country's most influential independent distributors. In January 2008, the Los Angeles Film Critics Association chose to give its first Legacy of Cinema Award to Doros and Heller of Milestone Film & Video "for their tireless efforts on behalf of film restoration and preservation." And in March 2008, Milestone became an Anthology Film Archive's Film Preservation honoree. In 2009, Dennis Doros was elected as one of the Directors of the Board of the Association of the Moving Image Archivists and established the organization's press office in 2010. He is currently serving his third term. In 2011, Milestone was the first distributor ever chosen for two Film Heritage Awards in the same year by the National Society of Film Critics for the release of On the Bowery and Word is Out. The American Library Association also selected Word is Out for its Notable Videos for Adult, the first classic film ever so chosen. In December 2012, Milestone became the first-ever two-time winner of the prestigious New York Film Critics' Circle's Special Award as well as another National Society of Film Critics Film Heritage Award, this time for its work in restoring, preserving and distributing the films of iconoclast director Shirley Clarke. Important contemporary artists who have co-presented Milestone restorations include Martin Scorsese, Francis Ford Coppola, Barbara Kopple, Woody Allen, Steven Soderbergh, Thelma Schoonmaker, Jonathan Demme, Dustin Hoffman, Charles Burnett and Sherman Alexie.